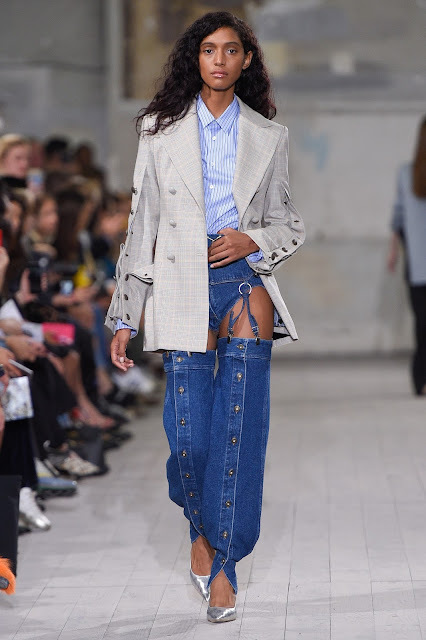 Saint Laurent was likely the most anticipated show of the day--or at least it was for me, my body in a classroom desk but my eyes scanning the show schedule, mentally saying "I don't know who that is... I don't know who that is... HEY, Saint Laurent!" As you can tell, I'm far from reaching the end of my journey in familiarizing myself with every single design house/designer ever, but I'm trying and having tons of fun with it! Special thanks to Harry Styles for introducing me to the world that is Saint Laurent. I know you're reading this. The show took place at 8 p.m. Parisian time, and the night-life feel seemed to be fitting for the dark-toned and dark-feeling collection. 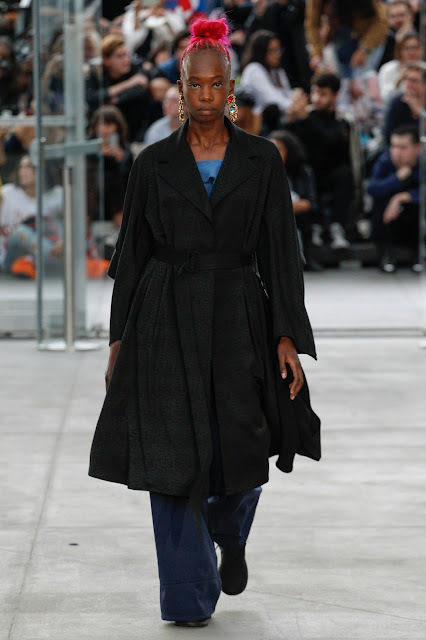 Black everything and mini dresses made of leather seemed anachronistic in what seems to be a season of bright color and energizing maximalism, and my mind immediately took this thought as a cue to file the collection into the "boring! I'm over monochrome" folder. A designer collection, though-- especially that of a well-known brand like Saint Laurent-- isn't just based off ideas like "I really don't think we should wear color in spring!" There's always a thought process, there's always an idea, there's always a message, and therefore, there's always magic. 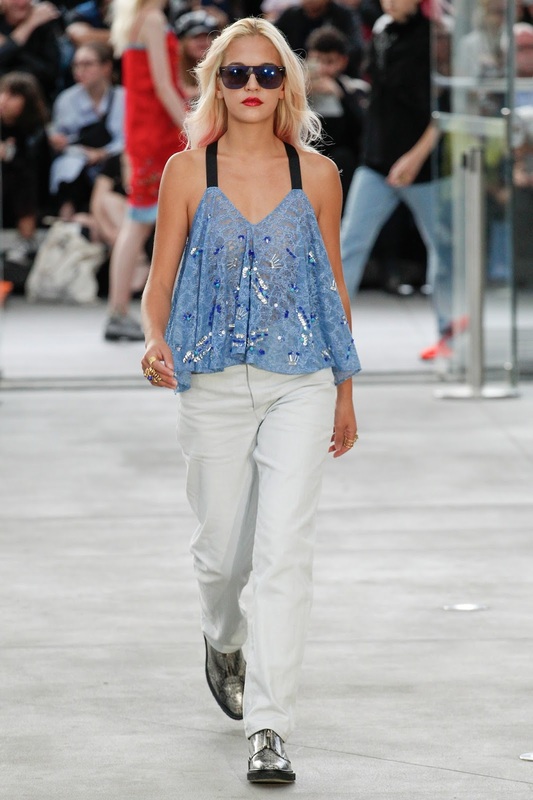 I found magic in the structural '80s-fied looks. 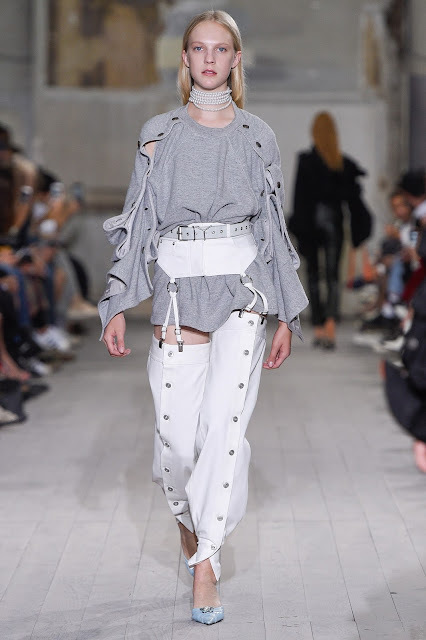 Emphasis on the "structural"- the shapes of the looks below made the much more unique and interesting. 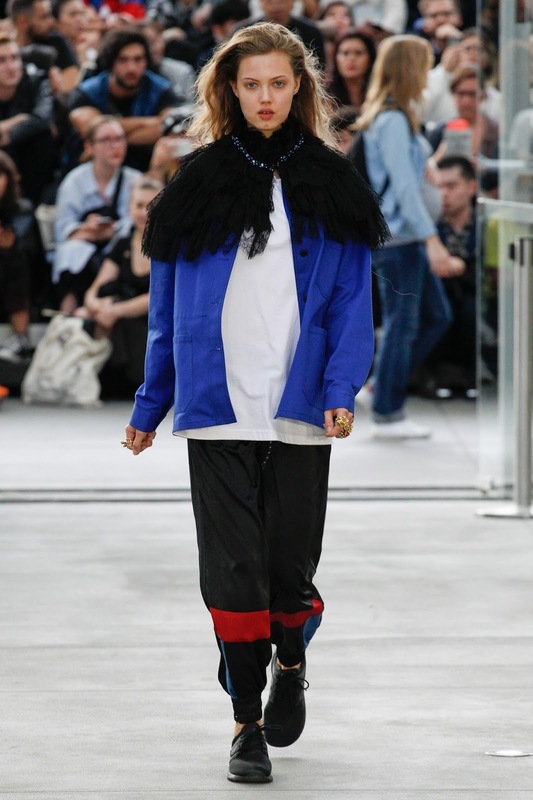 Jacquemus made a case for the straw hat, the heavily-padded shoulder (in a less ironic way than that of Vetements--Vogue said it, I agreed with it) and threw in an interesting case for the tutu. Folky-Parisian. Koché mixed street style with couture-like touches and did this really cool thing where public guests got to sit and fancy-shmancy people stood. Also, each model looked like she had her own identity and lifestyle, which was a surprisingly satisfying switch-up from the sometimes seen "50 models who all look like the same person" format. Y/Project hit us up with some heavy velvet and a pant style that seemed to be teetering on the edge of a decision called "To wear real pants or not to wear real pants." Revolutionary development in the #NoPantsFriday movement created by Man Repeller, and also a successful delivery of the message suspenders have probably been struggling to tell the world for years: "We still exist!!" I've missed a couple (Paskal, Paule Ka, Aalto, Nehera, etc. ), but these collections seemed most prevalent to me: some of the ones that were most well-received or talked about, and also some that were just my favorites of the day. Coming up for day #2: Dries Van Noten & Maison Margiela!! Tie your shoes & ready your insta feed.